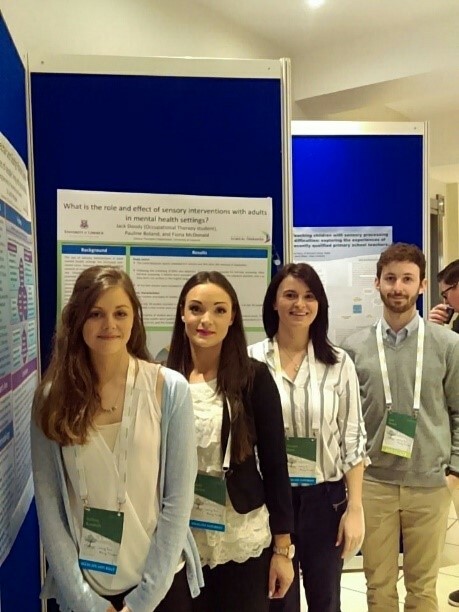 AOTI Conference 2017 aimed to highlight the progression and development of occupational therapy in Ireland and highlight the work of occupational therapists working to promote health and wellbeing through occupation. AOTI Conference 2017 focused on practical and research applications of innovative occupational therapy practices welcomed national and international occupational therapists to share and discuss their creative and pioneering experiences. AOTI went off without a hitch, but like most events there were small hiccups along the way. Having just celebrated AOTI’s 50th anniversary, this conference had to be the biggest and best yet. The two day conference honoured the ever growing occupational therapy sector in Ireland. With so many exhibitors showcasing their work, at times the space could seem slightly cramped. The addition of multiple sessions taking place, room changes added to this. The accessibility of the site was changed as needed to suit the needs of the delegates. • Extra time was allotted to allow delegates to get from one session to the next. The AOTI committee was easy going and handled this in stride. • Accommodations were made for any delegate requiring extra assistance with ease and professionalism. The Radisson Hotel and Spa Limerick was very supportive in any situation.